Shri Mahavir Jain Aradhana Kendra is a Dharma-Tirth. It is a unique Jain Pilgrimge Center. Involved in nurturing the cultural & religious heritage. Promoting age long religious tradition of Tirthankar Shri Mahavirswami. Acharya Shri KailasSagarsuri GyanMandir is a unique Jain and Indological academic research and reference center. 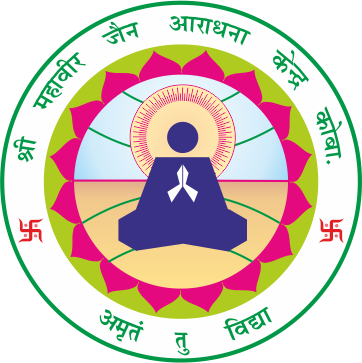 It is dedicated to support and promote Jain education, studies and research. Equiped with fully computerized & the largest Jain and Indological library in the world. Thus it gains the status of Gyan-Tirth. The Museum- Samrat Samprati Sangrahalaya preserves and nourishes the rare heritage of Jain Art and architecture has become a Kala-Tirth. Samrat Samprati Sangrahalaya is the collection of articles of Jain cultural and Shrut tradition. And thus it is a reflection of Jain and Aryan culture. The aims of this Museum are to publicize/ popularize the ideal principles of Bhagwan Shri Mahavirswami.